The Olympus SZX16 is designed for advanced research and leaves other stereos in its wake with a maximum numerical aperture (NA) of 0.3, producing a superior resolution of 900 line pairs per millimetre. With such amazing resolution (and peerless magnification) you can make your work more efficient, more precise and gain much more information from your samples. 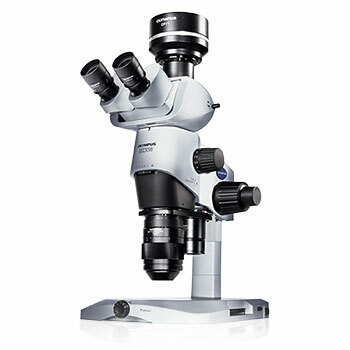 With a seamless zoom ratio combined with the most comprehensive range of parfocal objectives (0.5x, 1.0x, 1.6x & 2.0x), the SZX16 can take you from a macro-view to a micro-view allowing visualisation of whole organism down to fine microscopic structures such as biological cell components.